A new hydrogen cartridge has been created by James Dye, a scientist from the University of Michigan. This cartridge is a hydrogen fuel cell that can recharge GPS units, laptops, cell phones and other similar devices. Along with that, this is also designed to provide electricity in areas where it is inaccessible. The alternative energy is the result of 50 years of research by Dye, who is the director of the scientific council of SiGNa, as well as the University Distinguished Professor of Chemistry Emeritus in the said school. He has been working with alkali metals for years, which led to the development of the hydrogen cartridge. The hydrogen cartridge was developed using alkali metal silicides. Using salt and sand, sodium and silicon are produced. When water is added to sodium silicide, this will result in the production of hydrogen which leads to the creation of fuel cell energy. The byproduct of this process is sodium silicate which is basically the same substance that is included in toothpaste. 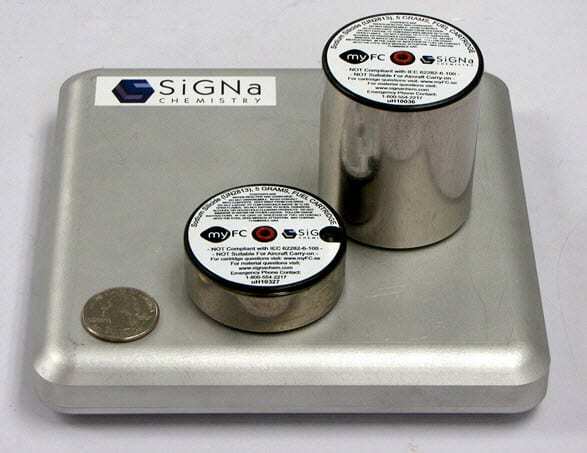 The research done by Dye was backed by SiGNa wherein a power platform was developed. This will produce low-pressure hydrogen gas that will later on be converted to electricity. This process is done through the low-cost fuel cell. This same process was also used by Dye in the creation of bicycles that are powered electrically where he assisted in its development. This fuel cell comes in ranges of 1 watt to 3 kW. It can power the bicycle for up to 100 miles with a speed of 25 meters per hour.